2007 Tank Sports Touring 150 Deluxe. Picture credits - Tank Sports. Submit more pictures. 2008 Tank Sports Touring Scooter 150 Deluxe, within 5 months the bike turned to a piece of junk! Review of the Touring 150 Deluxe submitted on 2010-08-06. I bought a 2008 Tank Sports Touring Scooter 150 Deluxe and within 5months the bike stopped working and remains (1year later) sitting in an auto shop NOT WORKING! The bike was brand new when I purchased it, and when first driven sounded like something was loose in the front wheel. Faulty electrical system does not allow the battery to charge. Had to jump battery multiple times to get back home, on my 3rd outing with the bike. Tank Sports has since filed bankrupt in the U.S. Additionally there are thousands of stories just like mine. I recommend NEVER BUYING TANK SPORTS products. 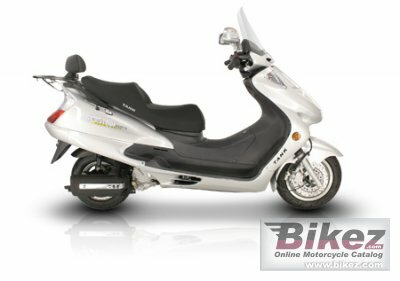 This review of the 2007 Tank Sports Touring 150 Deluxe was posted by a visitor on Bikez.com and does not necessarily reflect facts, truth or Bikez.com's opinions. Please report profane or otherwise inappropriate content by following this link.